We know you've been waiting for this one! Our Winter 13 Shoe Range is now available nationwide and online. Made right here in Christchurch, New Zealand on an old "Plastimatic" they're super comfy and look amazing, plus they're unisex from size 5 through to 11. Each pair is hand numbered and very Limited Edition so get in quick to claim your pair, free shipping peeps! Oh, and check out this video of the shoes being made, the good people at Commando-M let us get in the way for an afternoon to film this. 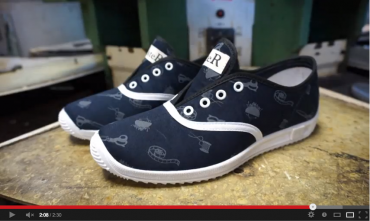 Don't forget to share the video with your friends, the shoes deserve it! Available from: Starfish, Thrive, Flock and Online through MisteR and Commando-M.